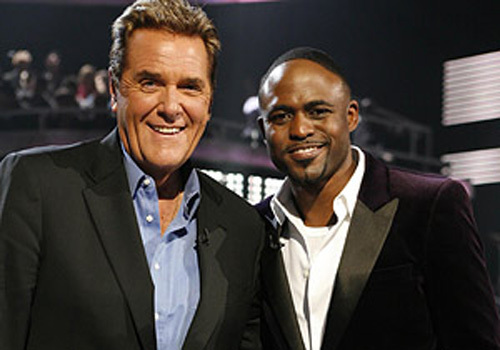 Host, Wayne Brady (photo from a previous season) will be reading from a revised song board this season (not pictured). Last season “Don’t Forget the Lyrics” featured celebrity singers for the first time. The karaoke-style game show recently wrapped its third season. Show ratings have proven to pull-in enough of an audience to book more name celebrity guests and contestants. That’s right, MORE celebrities will be singing when the new season airs on FOX. The two show dates I attended, featured Rick Springfield, Mark McGrath, Gary Dell’Abate (a.k.a. BaBa Booey), En Vogue, Survivor, game show host, Chuck Woolery, and lead singer of Men At Work, Colin Hay. Audiences also served as the background to a “People Magazine” photo shoot of producer, Mike Darnell. 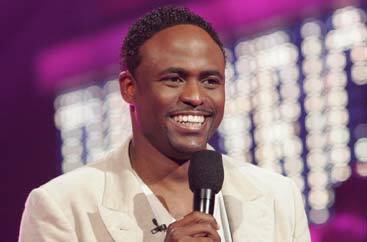 Wayne Brady announced his new debut R&B album, “A Long Time Coming” that consists of Brady singing a variety of cover songs. The show had a change of pace, and put two strangers on a blind date with each other on-stage. Their back-up included: ex-girlfriend, ex-husband, and of course, Chuck Woolery. They managed to help each other win a lot of money! Survivor sang, “Eye of the Tiger”, Rick Springfield sang “Jessie’s Girl” and his new single coming-out soon called, “What’s Victoria’s Secret”. En Vogue gave incredible performances of three songs. So incredible, that I forgot that I was on a game show set. More incredible, I’m not even an En Vogue fan, but I think I may be now. One contestant was given a second chance. He had gotten to the $25,000 mark on the show. But, gave what was thought to be an incorrect lyric to “The Brady Bunch” theme song. The lyric was: “That’s the way WE all became the Brady Bunch”. Instead, he gave the same lyrics, but instead of “we” he sang it as “THEY”. After the executive producer did some research that night after the show taping, the next morning, it was confirmed that during the first season of “The Brady Bunch” the theme song was not sung by the children of the show. Therefore, the lyric during the first season was indeed “they”. The show brought back the contestant and allowed him to play-out the rest of his game. Did his second wind benefit him with more money? Catch the new season when it airs. I love this show and looking forward to seeing Rick Springfield. He and I even share the same birthday. I went to see him in concert, first one I ever went to.